Messaging platforms like Slack, Snapchat, WeChat, Allo, and What’s App are all the rage - each with their own unique spin on messaging. Some say they’re killing email, and some say that’s not likely, but regardless it’s hard to argue that they aren’t changing the way we communicate with one another. One of the most interesting trends is the rise of “smart” messaging platforms, which allow participants to do more than just send text across a network. They allow for rich text, animated gifs, videos, sound-bites, and links to be sent in real time to one or more participants in the chat. This alone isn’t really new (AIM had a lot of this stuff a decade ago), but one thing that has changed is the speed and availability of these methods of communication. The other thing that has changed is the “smartness” of the servers relaying these messages, and that’s where messaging as a platform begins. What does “messaging as a platform” mean? In a traditional website, forms are used to handle input from users. For example, when you want to sign up for a service, you put your email address and name into a form and then click submit. This triggers a bunch of stuff on the backend to register your account and show you a confirmation page. Meanwhile if you used a messaging app as a signup medium, you might text your email address to a specific phone number and then their service will automatically text you back a confirmation. The messaging system you used (eg: SMS, Facebook, Slack) was the platform that kicked off your signup - something that has traditionally been done via the web or a smartphone app. What are some possible uses for message-driven platforms? So messaging as a platform is becoming increasingly popular as messaging apps become more popular, but in my example above it’s hard to see the real advantage of having users text you their email instead of just filling in a form online. On the other side, it’s hard to see the advantage as a user because signing up might get you the same content regardless of whether you sign up via a web form or text message. Let’s look at some messaging platforms and the ways that various people are using them today. Slack bots - Slack has hung their hat on the ease and accessibility for developers to create bots. This community of slackbot creators has released hundreds of open source bots that automate everything from the mundane to the extremely complex and allow Slack users to do all sorts of things without leaving Slack’s platform. Intercom - While Slack has become the go-to inter-team communication platform, Intercom has placed itself as the leader in sales and customer service chats for businesses. They have a platform that allows users on any website to chat directly with real humans who work there, asking questions or getting clarification before they sign up. Similarly, you can automate Intercom to proactively message users as they come to certain pages or enter specific inputs. Twitter auto-DMs - I’m sure the first marketers who discovered that you could automatically send direct messages to new followers had good intentions, but the automatic DM has been misused and abused. That said, Twitter is being used as an automated messaging platform for a few interesting cases. Using Facebook messenger to order pizza - Facebook opened up its messaging platform to bots earlier this year and since then several companies have taken advantage of the platform’s ability to take payments and interact with customers. Domino’s now allows you to order pizza via Facebook messenger. Google search results in a conversation - Google just released Allo, a messaging service that integrates with its search platform to allow chatters to search for things within a conversation. 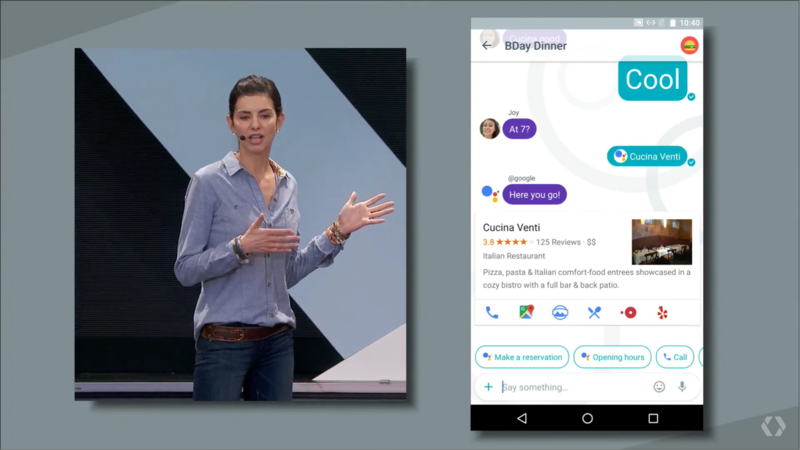 The implication here is that you could be talking with a friend about getting dinner and then use Allo to look for restaurants right in the middle of your conversation. For Google, the conversation is an interesting point for context, and I can imagine them showing different results based on the preferences of both parties rather than simply showing the best result for the asker. Real time, on demand stock quotes - This has been around for a long time, but it’s worth including as a simple example of messaging as a service. You can sign up to receive stock quote alerts for specific companies or industries via a service like Zignals. Arbitrary tasks or questions (eg: Siri, Amazon Echo) - Messaging platforms have moved beyond text, and one of the next frontiers seems to be spoken word. Apple, Google, Microsoft, and Amazon have voice-activated personal assistants that allow users to ask arbitrary questions or do simple tasks like create emails or calendar events. While few of these platforms are deeply integrated into third party services at this point, I’d bet that’s coming soon. Twilio for creating messaging services via SMS - Finally, Twilio has spent the past 8 years making SMS text messaging a more accessible platform for developers to create their own text bots or services. Using Twilio’s tools, you can make bots, send alerts, broker communication between anonymous users, and much more. WeChat allowing creation of apps within its chat app - WeChat might not be a familiar name to us in America, but as the dominant Chinese messaging platform it influences a huge portion of the world’s population. They are now allowing users to create “little programs” or apps within their chat application. I have yet to see an example of something created within WeChat, but keep an eye out for this very soon. A decade ago, the prevailing wisdom was that your company needed a website. A couple years later it was a social media page, and now it’s an app. It’s not hard to imagine a future where chat becomes an essential marketing channel. In the short-term, we’re seeing cutting edge companies use chat to rebuild existing applications, but I think that in the long-term certain applications will cease to exist elsewhere. Is there a need for every service to have a full-featured web or mobile application? Or, could a messaging app serve its customers just as well? At the same time, I realize that not every service will be served by messaging platforms. I don’t think you’ll be texting future employers your resume (although maybe I’m wrong), but I could see a world where I don’t have to log into Jimmy John’s website just to order a sandwich. What do you think? Have you seen any novel uses of messaging as a platform? Where do you see the trend going? Let me hear about it on Twitter.